How many times have you heard “it smells moldy” or “it smells like mildew”? In most cases, people simply smell a bad odor, find the source, and clean it up. We seldom investigate why, how, and how long the conditions existed, or wonder about the long-term damage to the surface and our health. Anytime mold/mildew is encountered, these questions should be asked immediately, and the reason for the growth should be discovered and rectified as quickly as possible. The terms mold and mildew can be used interchangeably; however, in most instances, the physical appearance will determine which name is used. Mildew is generally a white powder that can be disturbed easily. Mold generally has a darker, thicker look and cannot be disturbed as easily. Mold and mildew are typically pigmented fungal hyphae on the surface of organic materials. Fungi are spore-bearing organisms that do not have chlorophyll and live off organic materials. When fungi are attached to an organic surface for an extended period, they eat down into the material and become darker in color. This is why black mold is harder to remove than mildew. The color can range from white, black, red, and orange to gray. Mold and mildew are practically everywhere. They move as spores with the air currents and enter a building through open or broken windows; doors; building openings such as pipe penetrations, outside air make-up ducting, and open seams in vertical walls; and, the largest of all these sources, roof leakage. The openings allow not only spores but also moisture to enter, either in liquid or vapor form. Moisture infiltration raises the relative humidity (RH)—the amount of water vapor in the air. In this author’s opinion, when RH climbs above 55 percent, the growth of mold/mildew is greatly enhanced. The interior environment of most structures is negative in pressure relative to the outside pressure, so each time a window or door is opened, outside air will rush inside with all its pollutants. It is rare to have a structure designed to be neutral in pressure, meaning the outside and inside pressures are equal. The ideal temperature range for mold/mildew growth is between 40ºF and 100ºF. Adding a nutrient base (most everything in a structure) and moisture makes a perfect environment. Mold growth does not need standing water; high RH will do. Hygroscopic materials, which absorb and retain moisture, are prevalent in most structures. Most structures have plumbing, allowing water to be introduced for kitchen, laundry room, or bath facilities. Water may be spilled or a pipe may rupture. Some of this water will evaporate and exit the structure via the air handling system. Some will remain, however, creating conditions for mold growth. This is in addition to vapor moving into the structure via openings in the structure’s walls and roof or through the building materials themselves. Air’s ability to hold moisture depends on its temperature: the lower the temperature, the less water vapor it can hold. If the RH is 50 percent, then the amount of water vapor in the air is half of what it can hold. When the RH is 100 percent, the air contains all the water vapor it can hold, and the water vapor can condense to a liquid. This occurs when the temperature drops to its dew point. Both temperature and humidity can vary within a room. If you measure the temperature and humidity at several points in a room, you will find that the mold/mildew problem will be on the surface with the highest RH and next to the coldest surface. This surface is called the first condensing surface. Generally, this condition is present due to a break in the wall insulation, allowing wind to blow through the opening. Common entry points are windows, doors, vents, cracks, and chimneys. Mold and mildew can affect the health of occupants breathing the interior air on a daily basis. Some people are extremely sensitive to the spores. Exposure to high levels of Volatile Organic Compounds (VOCs) created by the degrading of substances while mold/mildew is growing can lead to irritation of mucous membranes and the central nervous system, causing dizziness, decreased attention span, headaches, and the inability to concentrate. The Mayo Clinic released a study in 1999 that stated that nearly all chronic sinus infections in the United States (about 37 million) were caused by mold. Mold also will trigger severe asthma episodes in sensitive individuals with asthma. Mold/mildew spores can be absorbed through mucous membranes, skin, and lungs. When dealing with this substance, appropriate safety gear such as an organic respirator, gloves, and goggles always should be worn. Workers also should wear long-sleeved clothing to protect their arms. Several approaches can be used to clean and remove mold/mildew. The first rule is to always clean with a wet material; never clean mold/mildew with dry rags or a dry brush, since this type of agitation will cause the spores to become airborne and spread to other areas. There are several products on the market designed to kill mold/mildew on surfaces, and some work. Over 30-plus years as a plant engineer, this author has tried several approaches but always came back to basic sodium hypochlorite, also known as bleach. One should apply a 5-percent solution of chlorine bleach mixed with water to the contaminated surface with a pump sprayer, allow to set for a few minutes, gently scrub with a soft bristle brush, and rinse with clean water. Repeat this procedure as often as necessary to kill all contaminants on the surface. The area should be well ventilated. Mold/mildew spores are virtually everywhere; vigilance is the only solution to minimizing its growth. The first step is to locate the point of entry. Check piping and/or vent penetrations (through walls and ceiling/roof), staining and/or moisture, peeling or blistered paint, soft and broken wall board, and cracks in floor/wall and ceiling/wall junctures. If access to the insulation is possible, it should be checked for wetness and staining. The source of the leakage problem could be one of these items or a combination of several. Each area of leakage must be fully repaired before a complete cleaning can be successful. Manufacturing facilities contend with mold/mildew problems on a daily basis. Most have ambient air temperature environments in their production areas and controlled environments in their process areas. All have walls that see the outside environment. All have miles of (it is hoped) insulated piping, the majority of which is in the overhead just below the roof, where temperatures can exceed 100ºF and RH can be 70 percent or more. Some pipes will pass through walls into a different environment, such as a mechanical room, normally at ambient temperature or warmer with a high RH (due to leaking steam, water, and damaged insulation) that will condensate and grow mold/mildew. Good maintenance practices are the key to preventing a mechanical room from becoming a breeding ground for mold/mildew growth. Simple steps such as preventing pipe leaks and properly maintaining insulation will help keep a clean mechanical room environment. 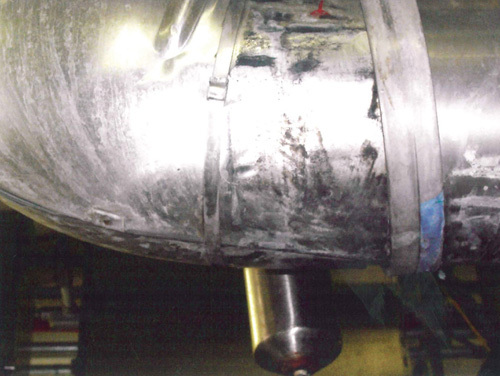 Selecting the correct insulation and jacketing is critical to reducing insulation repair requirements. Many owners choose to use a mastic coating over insulation in the building overhead and equipment room because those areas are unseen under normal circumstances and owners do not want the additional cost of insulation jacketing. Owners often have little understanding of insulation and its benefits, so price will be the governing factor in their decision to install jacketing or mastic. 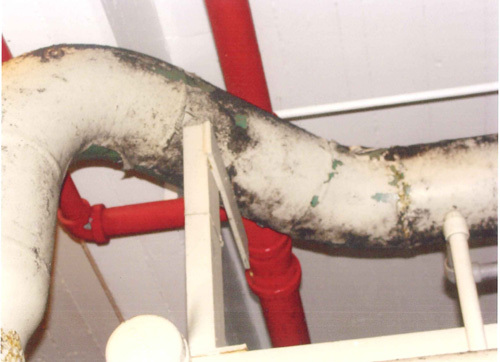 Insulation contractors should work diligently to help owners understand that the small difference in cost between the jacketing and mastic can save the long-term maintenance cost of repairing insulation damaged by a tool falling and breaking the mastic coating, or someone climbing on the piping.